Replacement George Horne’s 80th-minute intercept try put the seal on Glasgow’s first victory at the Dublin venue since September 2011, as they edged back ahead of Munster at the Conference’s summit in the battle for a home semi-final. They have a three-point lead heading into their home derby against Edinburgh in the final round in two weeks’ time. The Kearney brothers, Dave and Rob, scored two tries each for Leinster, who are already confirmed as Conference B winners. Captained by Sean O’Brien ahead of his summer move to London Irish, the hosts trailed 18-12 at half-time with Sam Johnson and Tommy Seymour swapping tries with the Kearneys and Adam Hastings kicking eight points. 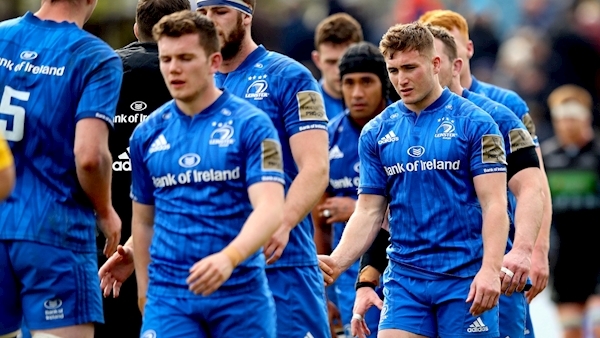 Robbie Henshaw got 58 minutes under his belt and fellow returnee Devin Toner played the full game ahead of Leinster’s Champions Cup quarter-final against Toulouse next week. 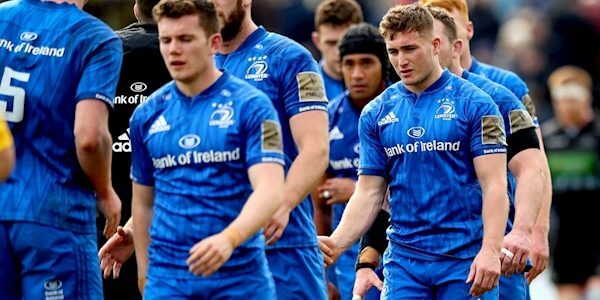 They looked set for a hard-fought win when the Kearneys struck again in the third quarter, but Glasgow displayed their own brotherly love with Matt and Zander Fagerson both touching down before Horne had the final say in Leinster’s first home defeat in any tournament since Benetton Rugby won here last April. 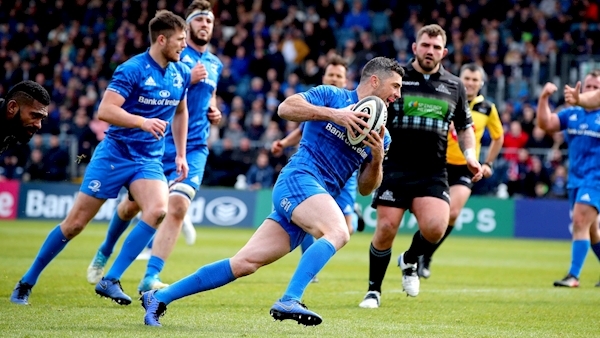 Despite losing fly-half Ross Byrne to the sin-bin for an early tackle on Seymour as the winger dribbled through into the Leinster 22, it was 14-man Leinster who landed the opening try. Replying to Hasting’s fourth-minute penalty, Jamison Gibson-Park’s looping pass was gathered by Dave Kearney who jinked inside Stuart Hogg to register a five-pointer from close range. The visitors edged ahead at 6-5 thanks to a straightforward Hastings penalty, and they followed up with a classic breakaway try. Ali Price slipped clean through from a ruck and passed out the back door for the supporting Johnson to sprint the final 40 metres to the line, bouncing off Byrne’s last-ditch tackle to finish emphatically. The elder Kearney, Rob, hit back five minutes before the interval, Toner and the home pack wearing down the Warriors through 30-plus phases before the full-back initially fumbled a Byrne pass over Niko Matawalu’s head but successfully reclaimed it to score his first Leinster try since scoring against the same opposition in September 2016. Byrne’s conversion made it a one-point game at 13-12, only for Dave Rennie’s side to score right on half-time when Seymour went over in the right corner from a cracking lofted pass by stand-off Hastings. Boosted by the introduction of an all-international front row from the bench, Leinster went back in front when half-backs Gibson-Park and Byrne passed to the blindside of a ruck for Rob Kearney to reach over in the 51st minute. The margin was out to six points after Jordan Larmour’s jinking run caused problems for the Scots’ defence, Rob Kearney provided the link and his younger brother shrugged off Matawalu’s challenge to complete his own brace on the hour mark. However, Glasgow were only 24-18 in arrears and soon showed exactly why they are the Championship’s form team with 34 points out of a possible 35 won in the last seven rounds. Hastings’ conversion reclaimed the lead following number eight Matt Fagerson’s try from a well-executed 64th-minute lineout maul, and his tighthead-playing sibling drove in low to join him on the scoresheet after a series of pick-and-goes with eight minutes remaining. The bonus point score was converted by Hastings who finished with 14 points following Horne’s interception of a Hugh O’Sullivan pass.